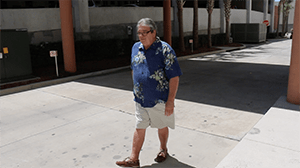 Thanks to minimally invasive lumbar spinal stenosis treatment involving decompression and fusion surgery with Stephen R. Goll, M.D., a board-certified orthopaedic spine surgeon at Orlando Orthopaedic Center, Scott got rid of his constant pain and can now walk pain-free again. After undergoing a thorough physical examination and MRI with Dr. Goll, Scott discovered he had what’s known as lumbar spinal stenosis, a narrowing of the open spaces within the spine. His results also showed that he had degenerative disc disease in his lower spine and a herniated disc. By age 50, about 95% of people will experience degenerative changes in their spine. Spinal stenosis is most common in adults over 60 years of age. Scott first attempted to relieve his chronic pain with oral medication and physical therapy. When those methods failed, he tried to find relief through epidural injection; however, that too could not help him reduce the constant discomfort he felt, especially when walking or standing. Scott and Dr. Goll decided that his best chance of regaining his quality of life would be to undergo minimally invasive transforaminal lumbar interbody fusion (TLIF) surgery. What Is Minimally Invasive Lumbar Decompression and Fusion Surgery? Lumbar decompression and fusion is a surgical procedure to alleviate pressure on the spinal cord or on one or more of the compressed nerve roots that pass through the spinal canal. The traditional method of performing spine fusion surgery has been to use longer incisions to allow the surgeon an expanded view of the spinal column. However, technological advancements have allowed spine surgeons performing lumbar fusion surgery to operate using state-of-the-art instruments and tiny tubes through minimally invasive incisions. Rods, screws, a specially designed spacer, and a bone graft is implanted into the space between the affected vertebrae, allowing the bones to grow and fuse together over time. Many patients experience considerable improvement of their symptoms after surgery and can get back to their regular activities in just a few weeks. Working in conjunction with a certified physical therapy and rehabilitation program, patients can expect a full recovery in about six weeks after surgery. Exact recovery times both in the hospital after surgery and during the rehabilitation phase depend on each patient’s personal and medical history, lifestyle, and the nature of the procedure.